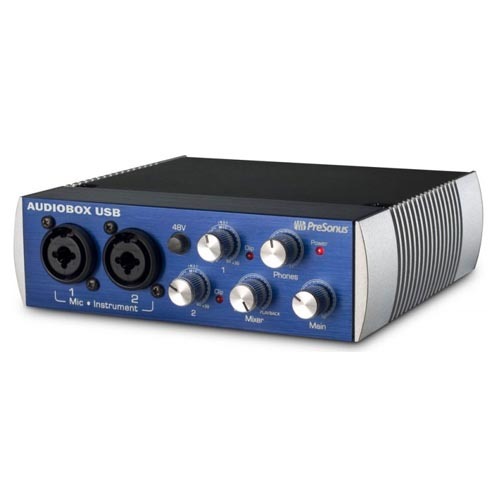 Presonus AudioBox USB 2×2 Audio Interface NEW LOWERE PRICE! The PreSonus AudioBox USB 2×2 USB recording system is an excellent solution for achieving high-quality, professional-sounding recordings no matter where you are. The AudioBox USB is a USB bus-powered audio recording interface loaded with 2 microphone/instrument inputs with 48V phantom power, 2 balanced TRS outputs, and MIDI I/O so you can stay portable without sacrificing your sound. The AudioBox USB also comes with Studio One Artist music creation and production software which has the same platform and intuitive interface as Studio One Pro but with an unlimited track count so you can start recording right out of the box.